The latest additions to its Mercedes-Benz-dominated fleet of 35 trucks are a 7.5-tonne Atego and an 18-tonne Actros. They were supplied by Dealer Euro Commercials (South Wales) and are fitted with curtainside bodies by JC Payne, of Walsall, West Midlands. Established in 1988 by John and Claire Wood, Glass Systems is now the largest independent sealed unit manufacturer and glazing supplier in the UK, producing nearly 50,000 insulated glass units per week. The Group encompasses three separate companies that provide a full spectrum of products and services to the window, conservatory and door industries. In addition to its flagship headquarters on Swansea’s Central Business Park, it has other manufacturing facilities in Pontyclun, Port Talbot and – opened last year – Peterborough. Glass Systems distributes its products on special stillages to job sites and warehouses throughout Wales and southern and central England, as far north as Manchester and South Yorkshire. The backbone of the fleet are its 18-tonners. The line-up also includes a drawbar rig that operates at up to 32 tonnes gcw while the 7.5-tonners, one of which is based at each factory, are used to make small and urgent deliveries. 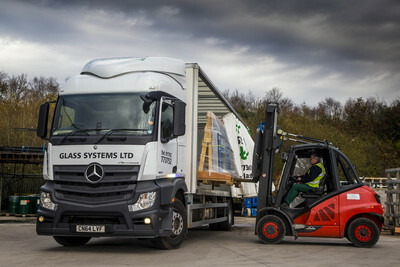 Glass Systems’ latest trucks combine well proven Euro VI engine technology with exemplary levels of cab comfort. The Atego 816 has an S ClassicSpace cab and a 115 kW (156 hp) four-cylinder engine, while the Actros 1824 has an aerodynamic StreamSpace sleeper cab and is powered by a 175 kW (238 hp) six-cylinder unit. Both drive through smooth, standard-fit Mercedes PowerShift 3 automated transmissions. Mr and Mrs Wood remain at the helm as, respectively, Managing Director and Financial Director. “We continue to grow our business in partnership with Mercedes-Benz and Euro Commercials,” said Mr Wood. As well as excelling in terms of fuel efficiency, operating costs and driver comfort, Mercedes-Benz Trucks lead the field in terms of safety. The Actros includes in its standard-fit armoury of active and passive equipment an electropneumatic brake system (EPB) incorporating anti-lock braking (ABS) and anti-slip regulation (ASR), which brakes each wheel individually to make the most of available grip and minimise stopping distances. EPB includes secondary braking – whether by engine brake or retarder – to further improve safety and reduce wear, while in the event of emergency braking the system automatically activates the hazard warning lights to warn following traffic, winning vital extra seconds that could help to prevent an accident. Other standard safety features on the Actros include Stability Control Assist, a rain and light sensor and a seat-belt monitor.